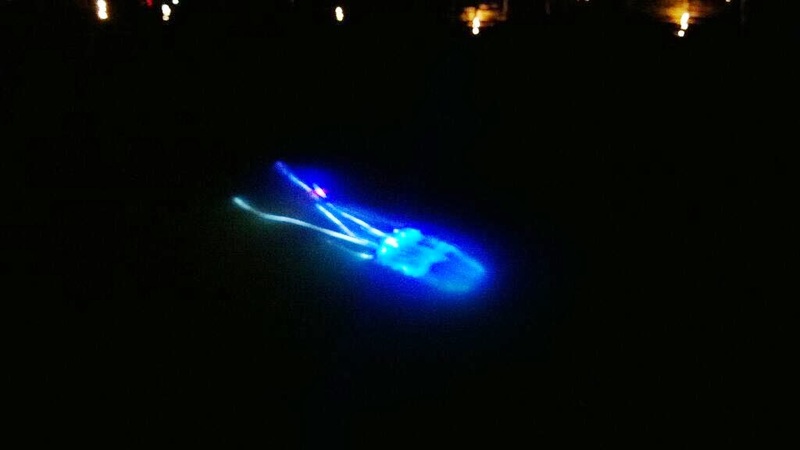 We now can identify the glowing, alien-like sea creature that was spotted swimming on the surface of Bristol harbor in the U.K. on Tuesday night. It was a Publicitii stuntus. Or in plain English: a publicity stunt. The elaborate hoax that fooled many in the British city—including a member of Parliament, Kerry McCarthy, and the BBC Bristol, which called in an expert from the Bristol Aquarium to help explain the bizarre sea creature sighting on a breakfast show—was concocted to promote “The Happenings,” a new television show in the U.K.
“In ‘The Happenings’ magicians Barry and Stuart use techniques of illusion to bring incredible movie-like experiences to British and American towns,” Steve Hornsey, general manager of UKTV channel Watch, told The Telegraph. A marine biologist had told the London Evening Standard that the sea creature could be a marine salp, which had drifted off course because of the weather. Another suggestion was bioluminescent hydrozoan jellyfish. As it turned out, it was someone’s very cool interpretation of a marine creature.